Why is a training program necessary ? Many trainees arrive at the gym and “bust their balls” doing whatever exercises they feel like doing for that particular workout. A far more sensible alternative is to follow an effective system tailored to your goals. Whist training to a pre-planned system is arguably not always a prerequisite for physical training success, it has distinct advantages over not following one. Performing exercise in a haphazard fashion, without predetermined goals, is not training. There is a difference between exercise and training, and arriving at the gym doing whatever you feel like is exercise, but it is not training. Training can’t be accomplished randomly, because randomly applied stresses do not create a specific adaptation. Training” and “Exercise” are different things entirely. Training is the process of directed physical stress, which results in an adaptation that satisfies a performance goal . Now that we have established that a training program is highly advantagous, which routine do you choose? It is important that the training protocol you utilise is aligned to your immediate goals, and tailored to your level of strength and physical development. The less experienced you are the simpler the program should be. Conversly, the more advanced your training level, the more complex the program must be. The most effective systems for beginner trainees are simple to understand and impliment. Complex or advanced systems are generally ineffective and negate progress. Advanced trainers have already served years under the bar on basic compound movements, in order to build their foundation, and using or tagging their speciaIist routine onto yours is self – defeating. Simply put, advanced techniques are for advanced lifters and doing them as a beginner will not make you advance; it will make you stagnate. Additionally there are some systems that are marketed as “special,” or “secret” routines, often incorporating multiple exercises and their variations, in order to give the illusion of expertise and credibility. These are also to be avoided, as they are designed primarily to part inexperienced beginners from their hard earned cash. Unfortunately there are no “secrets to success,” or special routines – just hard work, proper nutrition and time. The most effective training systems should be based around an optimum number of primary, compound barbell movements which cover all the bases. In order to optimise physical adaptation, the system will effectively manipulate volume, intensity, and recuperation, not increase the number or variety of exercises performed. One system which fulfills this criteria is Stronglifts 5×5 workout. One of the most popular training protocols around is the Stronglifts 5×5 workout. I highly recommend that you visit Mehdi’s site and read the rationale and protocol for this system. As its name implies it is based on 5 sets of 5 reps, it also employs only 5 exercises, but these are primary, compound moves which cover all requirements. The stronglifts 5×5 workout requires the trainee to employ the following 5 barbell lifts : the deadlift, squat, bench press, overhead press, and bent-over row. It’s a three day per week program that employs two different workouts (Day A and Day B) alternated throughout the training week, with a rest day between each training day. The program is primarily based around the big three lifts (squat, bench press and deadlift) with the squat being performed every workout. Day A lifts are the squat, bench press, and bent-over barbell row. Day B lifts are the squat, overhead press, and deadlift. Each lift is performed for 5 sets of 5 reps, with the exception of the deadlift, which is only 1 set of 5 reps. The rationale for this is sound and based around avoidance of overtraining the deadlift. Deadlifts have a notorious reputation for beating up the body when performed for multiple heavy sets. The goal is to increase the weight lifted by 5 pounds each workout, for as long as this can be sustained. If you manage five reps on each set, add 2.5kg/5lb next time you perform that exercise. The deadlift however, is increased by 10 lbs. The deadlift employs more overall musculature than any other exercise, therefore greater increments in weight can be sustained. Before commencing this program you will need to determine your 5 rep max for each exercise. The loading begins with 50 percent of your 5-rep max for each lift. This admitedly appears light, but you will be adding 5 lbs to the bar each workout, and ten for the deadlift. This equates to 60 lbs per month on squats and deadlifts. Don’t be tempted to ignore this loading parameter and start too heavy with this program, especially on the squat. Your body will need adequate time to adjust to the movement patterns and frequency of the lifts. If you follow the program you will soon be using very respectable weights, eliciting significant size and strength adaptations. The program continues until the point comes where further increase in weight results in failure, before completion of the required repetitions. Following this you would then continue with the same weight for your next workout, rather than increasing weight. If you fail to complete 3 consecutive workouts then you deload by 10% for the next workout only. This is not the first system to employ 5×5, and it is by no means unique. The 5×5 training protocol has been popular for many decades. In fact Reg Park a bodybuilder from the 1960’s and training idol of a certain Arnold Shwarzenegger, advocated a 5×5 regime. 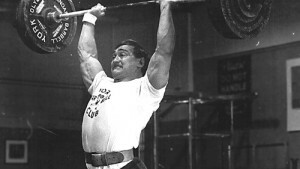 Later, so did the hugely infuential strength guru and coach Bill Star – the mentor of Mark Rippetoe, who’s “Starting strength” is also based around the same concept. They are all simple effective systems, which employ predominantly ground based, compound, multi-joint movements for 5 sets of 5 across. The Stronglifts 5×5 workout is essentially designed as a foundation program, and is not a bodybuilding or powerlifting program per se, although trainees will most certainly gain both size and strength. Although deemed a 12 week system, it can be continued so long as you are making progress. The closer you get to your natural genetic limit, the harder it will be to sustain strength increases. There is no direct arm work in this routine, which is fine for beginners, and unless you are a bodybuilder probably not required anyway. Trainees will derive sufficient growth stimulation from the heavy presses and rows. I’m not sure how well some newbies would follow this routine without resisting the temptation to curl in the squat rack though! The Stronglifts 5×5 workout system is simple and easy to follow. The only equipment necessary are a squat rack, bench, and a weighted barbell. A power rack, though not an absolute neccesity, would be highly advantagous primarily for squats as you get stronger. If you miss a lift and can’t get out of the hole the pins in the rack will save you. The Stronglifts 5×5 workout is primarily geared around increasing strength, and it is extremely effective in this regard. It employs progressive overload of the primary, compound multi-joint movements. It doesn’t waste the trainee’s time with innefective machine or isolation movements. For the beginner especially, this is very important. A strong foundation in size and strength is imperative at the start of your weight training career, and the movements utiised in Stronglifts 5×5 workout routine will provide both. One caveat here though, do not prioritise weight lifted over exercise form – this is one of the commonest mistakes that a beginner can make. Sloppy exercise form will not make you stronger and will just lead to injury at some point. This is especially important with heavily loaded movements like squats and deadlifts. Ensure strict exercise form is employed at all times. In the abscence of a spotter or training partner, form mistakes can sometimes be difficult to correct. You will be squatting 75 reps per week for example so you will have plenty of time to get your form nailed down. It is important therefore, to get this right and there are comprehensive lift instructions on Mehdi’s site. Whist initially, a 30 minute total workout duration is assumed, be mindful that this will increase somewhat as you become stronger, and require a longer warm up. For example, when you are squatting say 120kg for 5×5 you should still be starting with an 20 kg empty bar on your first warm up set. As you become stronger, you may also need longer rest periods between sets. Total workout duration is still realistically well under an hour at this point, which is fine, and from a hormonal point of view is probably optimal. Training hard for longer than 1 hour increases production of the stress hormone cortisol which is catabolic and therefore counterproductive. Once past beginner status the Stronglifts 5×5 workout may not incorporate enough training volume to provide optimum muscular size gains. For more advanced bodybuilding trainees attempting to optimise hypertrophy, higher repetitions than 5 would need to be used. Indeed as Mehdi states on his site the Stronglifts 5×5 workout system is not designed for competitive bodybuilders. Also experienced lifters would no doubt require increased intensity to that provided by a fixed 5 rep routine. Overload must be progressively increased for consistent gains in strength to occur, and the stronglifts 5×5 workout provides that. However, because of the risks of over-training and the law of diminishing returns, constantly increasing the resistance is sometimes counter-productive, hence the deload component when progress significantly plateaus. Whilst I hate pulldowns where only the arms move, I am a massive fan of chins and am not sure whether bent over rows might be better substituted with chins. This is a personal preference however and 5×5 chins would be too much for the strength levels of most beginners, and even some more advanced trainees, especially if they had higher levels of bodyfat. In conclusion, the Stronglifts 5×5 workout system is an excellent one and highly recommended for those beginning their training journey wishing to gain size and strength. This may well be the best, and easiest to follow system for those starting out. In its basic form it has more limited benefits for intermediate, and advanced trainees, and an adapted regime would need to be utilised. Certainly more advanced practical programming would be required for experienced lifters. There are several other routines which are based around 5×5 for more advanced trainees. Additionally, depending on whether you are are a bodybuider or strength athlete alternative systems such as Eric Helms’ hypertrophy routine, the Texas method, or Jim Wendler’s 5:3:1 may be more appropriate.